LAMBERVILLE, JEAN DE, Jesuit missionary to the Onondagas, diplomat, b. at Rouen, 27 Dec. 1633; d. in Paris, 10 Feb. 1714. Lamberville completed his literary and philosophical studies at the Jesuit college of Rouen and at the age of 23 entered the noviciate in Paris (3 March 1656), where he taught grammar and humanities and completed his own theological studies. He came to New France in 1669, and was immediately assigned to the Jesuit missions where he remained until 1687, when all missionaries were expelled from the Confederacy and the territory claimed by New York. Lamberville’s first encounter with the Onondagas in their village communities was at the mission of Saint-Jean-Baptiste. His impressions in 1672–73 were that only the superior persons could ever be converted and even so it would be necessary to employ generous presents and force of arms: “two arms, one of gold, the other of steel.” Two years later, however, he could report some success, owing partly to the assistance of the converted chieftain Garakontié* who seconded his evangelical efforts. He also began to make good use of the medical supplies sent from France and became especially adept at bleeding and extracting teeth. Of the 72 converts he had won in a year he estimated that no fewer than 40 had died. In 1677, as newly appointed superior of the missions among the Five Nations, Lamberville faced increased persecution and hostility, much of it fomented by Dutch and English traders. The latter resented and feared the political implications and economic consequences of Jesuit spiritual ascendancy among the Iroquois tribes. Lamberville always maintained cordial, but strictly correct, relations with the foreigners to the south. On one occasion he returned a stolen gun and powder box to Jeremiah Van Rensselaer, but he explained in an accompanying letter that his humanity would not allow him to return a runaway slave to Albany. Of 36 children and 23 adults baptized in 1677–78 only 12 survived the epidemics that ravaged the villages. A particularly cruel loss to the missionary was the death of Daniel Garakontié, whom Lamberville attended throughout his last sufferings. He personally made the chieftain’s coffin and buried him with all the marks of honour and love he could display in a hostile encampment. The Europeans not only had intensified economic competition and intertribal rivalries, but also had introduced diseases of epidemic proportions. By 1682 the patient and long-suffering Jean de Lamberville was able to instruct and baptize about 50 children annually, although by and large adults were still beyond his ministration. Resentment against his person, although not against the social and cultural force he represented, seemed to have subsided considerably. The Jesuit superior, Father Beschefer, wrote in 1683 of “the great reputation” Jean de Lamberville and his brother Jacques enjoyed among the Onondagas and attributed their improving position to their sympathetic understanding of Iroquois culture and to their judicious employment of medicines sent by the Maréchal de Bellefonds. Lamberville’s own correspondence gives a vivid and valuable picture of Onondaga domestic life, detailed accounts of the consequences of the liquor traffic, and insights into the missionaries’ use of persuasion and penance to enforce social order. 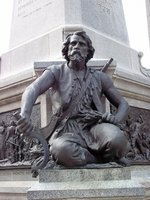 Lamberville alleges that on one expedition against the Illinois the Iroquois devoured 600 captives. Still he did not lose his patience and sympathy towards the tribesmen among whom he lived and laboured. Lamberville was soon to emerge as the man of peace, the great diplomat whom the Iroquois could trust but who was betrayed by the French. He had difficulty explaining to the aborigines the complexities of French politics. When the Iroquois pillaged a French fur convoy, because they had been given to understand they should intercept all non-licensed traders, Governor Le Febvre* de La Barre prepared for war while appealing to Lamberville to negotiate the usual reparations required in such circumstances. Lamberville did not suspect the governor’s double-dealing, but he did warn him repeatedly of the futility of attempting to divide the Iroquois Confederacy. When La Barre’s ill-advised military expedition foundered in 1684 and he found himself out of provisions, encamped in a pestilential swamp at the source of the St Lawrence, with the majority of his men incapacitated by illness, he was forced to accept a humiliating conciliation and to beg Lamberville to make peace for him. Lamberville again warned that a military conquest of the Iroquois cantons would require at least 1,000 soldiers. He was one of the few individuals in the colony who vigorously defended the governor’s decision to come to terms with the Iroquois. When La Barre was recalled, his successor Brisay de Denonville came to New France with orders to crush the Iroquois. 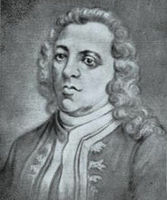 His preparations, unknown to Lamberville, included building a fleet of flat-boats for transport, fortifying Montreal, and gathering arms and ammunition. In 1686 Lamberville, who remained in the Onondaga country with his brother despite insults and ill-treatment, was summoned to Quebec by Denonville and became the unsuspecting instrument of the latter’s tactics. Denonville provided him with numerous presents for the tribesmen, commissioned him to invite representatives from the Confederacy to a parley at Fort Frontenac and seemed to accept Lamberville’s conciliatory views. Denonville wrote, “This poor father does not suspect our design. He is a clever man; but if I recalled him from his mission our purpose would be suspected and the storm would burst on us.” Lamberville assembled 40 chieftains and with difficulty persuaded them to go to Cataracoui to meet the governor in the midsummer of 1687. Denonville, meanwhile, betrayed the missionary’s trust and assembled a sizable force at Cataracoui, seizing the Iroquois who were in the immediate vicinity and sending over 30 of them to France to serve in the Mediterranean galley fleet. Lamberville learned of this bellicose policy from some English envoys at Onondaga, who had received word through trade contacts in Montreal. These Englishmen urged Lamberville to retire with them to the safety of New York, where Governor Dongan, a Roman Catholic, would afford him safe passage to France. The alternative, they suggested, was almost certain massacre by the Iroquois once they learned of the French betrayal. 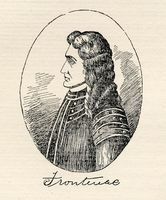 Lamberville refused their offer of assistance and in the company of eight Iroquois delegates left immediately for Cataracoui to ascertain the facts. On the way they encountered several warriors who had escaped from Denonville’s camp. It is a tribute to the esteem the Iroquois had for Lamberville that they did not harm him. Instead, they conducted him safely to the edge of the French encampment. 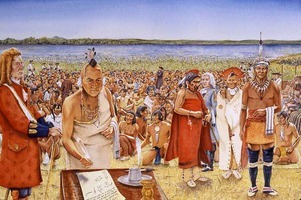 He was unable to change Denonville’s plans but he did obtain the release of several notable Iroquois prisoners. During Denonville’s campaign against the Senecas in 1687 Lamberville remained with his brother at Fort Frontenac where he acted as chaplain for a garrison of some 140 men weakened by scurvy. In this capacity he sometimes visited the garrison at Fort Niagara. On one such journey the Iroquois attacked the vessel carrying Lamberville, and during a heated three-quarter-hour battle the latter first prayed and urged the men to fight to the death rather than be captured and tortured, then took part in the fighting himself. In December he was again asked to negotiate with the Onondagas, a mission which he willingly accepted although he was already ill with scurvy. He presented two collars to the chieftains, one to urge them to treat the French prisoners well and the other to ease the shame of the Seneca campaign. These tokens were later presented to Governor Dongan who successfully inflamed the Iroquois against the French. Dongan insisted on the release of all Iroquois galley slaves, the abandonment of the Indian reserves, the demolition of the forts at Cataracoui and Niagara, and the restoration of the booty taken from the Senecas. On his return to Cataracoui Lamberville was so weakened by scurvy that he had to be hauled by sled, more dead than alive, to Montreal in February 1688, where for two and a half years he suffered as much from the attempts to cure him as from the malady. At least he could find some consolation in the fact that because he had contracted the disease while serving the troops, the royal officials defrayed his expenses during all this time and paid those who had cared for him. 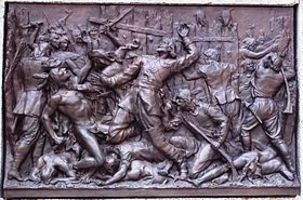 When an Iroquois delegation returned seeking definitive peace terms in August 1688, the Huron chieftain Kondiaronk waylaid it, killing some of its members and telling the rest that he had attacked them on orders from the governor. In revenge the Iroquois launched a general attack on the colony, especially on Lachine, on 4 and 5 Aug. 1689. Lamberville’s work was ruined. His superior, noting his precarious health, his bitter disappointment and his advanced age, sent him to France as procurator of the Canadian mission. With the return of Frontenac to New France and the sending of expeditions into English territory, the diplomacy of Lamberville was no longer required. To a friend he confided his desire “that I may end in our dear Canada the few days that remain to me,” and the Onondagas sent a request to have him back in their villages. These desires remained unfulfilled at the time of his death in Paris on 10 Feb. 1714 at the age of 81. AHDQ, Lettres, I. AN, Col., C11A, 6–9. ARSI, Gallia 110/II, ff.107a, 116. Baugy, Journal (Serrigny). Charlevoix, Histoire (1744), I. 509–49; II, 282, 333fr. 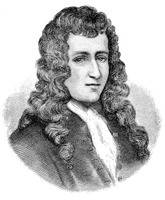 François Élesban de Guilhermy, Ménologe de la Compagnie de Jésus . . . , assistance de France, comprenant les missions de l’Archipel, de la Syrie, . . . du Canada, de la Louisiane . . ., éd. [Jacques Terrien] (2 part., Paris, 1892), première partie, 225–77. JR (Thwaites). Lahontan, Nouveaux voyages, II. La Poterie, Histoire (1722), III, 1–58. Mission du Canada: Relations inédites de la Nouvelle-France (1672-1679) pour faire suite aux anciennes relations (1615-1672), [6 éd. Félix Martin] (2v., Paris, 1861), I. 30–57; II, 39f., 108–14, 196–204, 347. NYCD (O’Callaghan and Fernow), III, 488f. ; IX, 226–28, 252–62. [Jeremias Van Rensselaer], Correspondence of Jeremias Van Rensselaer, 1651-1674, ed. A. J. F. Van Laer (Albany, 1932), 447f. Campbell, Pioneer priests, I. 226–45. Rochemonteix, Les Jésuites et la N.-F. au XVIIe siècle, III, 154–222. C. J. Jaenen, “LAMBERVILLE, JEAN DE,” in Dictionary of Canadian Biography, vol. 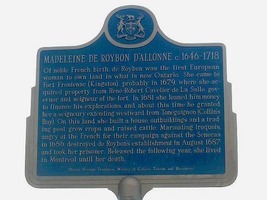 2, University of Toronto/Université Laval, 2003–, accessed April 24, 2019, http://www.biographi.ca/en/bio/lamberville_jean_de_2E.html.